Can't make it to class? No problem! I have DVDs available for purchase! Better Balance Through Stretching and Strengthening follows the same basic structure as my Better Balance Class (see My Classes for more information), and includes many of the same exercises. Divided into three easy-to-follow sections, the program includes a 16-minute seated warm up; 11 minutes of standing strength and balance exercises; and an 11-minute seated resistance band workout. 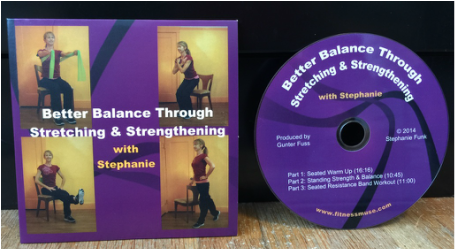 The DVD is designed for older adults interested in building more strength and flexibility at a gentle pace. My students love it, and you will too! All Around Fit Stability Ball Workout is a 60-minute program designed to stretch and strengthen your muscles, improve posture, and challenge core strength and balance using a Swiss exercise ball. Based on my Pilates on the Ball class, the program includes a warm-up; seated, prone, standing, and supine exercises; and resistive band exercises. The DVD is designed for older adults ready for a challenging but safe core workout. View a ﻿sample﻿ on my YouTube channel. $12 + $2.50 shipping for the DVD only; $15 + $2.75 shipping for the DVD with a resistance band (choose orange for light resistance; green for medium resistance; blue for heavy resistance; purple for extra heavy). Click on Contact Me for more information or to order.